You don't have to make a trip to the photo store to print crisp, vivid, bright photos - instead, print them directly from a photo printer using this HP premium Plus photo paper. Create detailed photos and place them in a scrapbook that'll last for years, or pass out snaps of a vacation to your friends and family. Create long-lasting glossy photos. Photo paper with 11.5 mil thickness delivers vibrant color and deep, realistic skin tones. Heavy thickness resists wear and tear. Handle them all you want — photos made with this extra-sturdy paper will hold up to frequent handling without tears or peeling. Perfect for your family albums. Unique back coating keeps photos from bleeding. HP's special coating keeps photos from bleeding onto each other. 90 and 110 brightness deliver vibrant colors. The bright white surface is perfect for high-resolution digital photos and reprints, as well as cherished family photos. You'll get realistic skin tones and true photo quality. Glossy photo paper comes in a pack of 25 sheets. 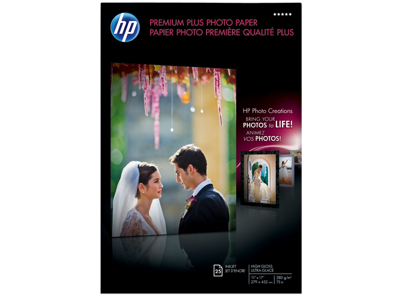 HP's thickest, heaviest and best all-around photo paper maximizes color intensity with a professional-quality high-gloss or non-glare soft gloss finish that renders realistic skin tones and resists fading for generations. Optimized for HP’s latest inkjet printers. For HP DeskJet 9600 and 9300 Printer series. Not recommended for DeskJet 1000, 1100, and 1200 Printer series, HP Color Inkjet cp1700 Printer, or HP Business Inkjet 2600 Printer series. Not recommended for use with HP Vivera pigment inks including HP Photosmart Pro B9180 Photo Printers, HP Designjet Z2100, and Z3100 Printer series.